Belfast Tourism-City Hall is Belfast City Council's civic building. It is located in Donegall Square, in the heart of Belfast city centre and a visit to it should be on your list of things to do in Belfast in County Antrim one of the northern Ireland counties. The site now occupied by City Hall Belfast was once the home of the White Linen Hall, an important international Linen Exchange. The city hall in Durban, South Africa is almost an exact replica of City Hall Belfast. City Hall Belfast first opened its doors on 1 August 1906. 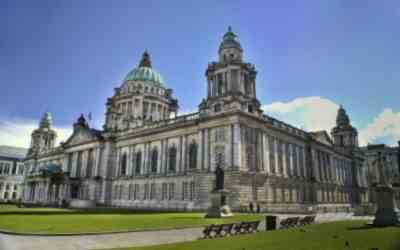 Plans for the City Hall began in 1888 when Belfast was awarded city status by Queen Victoria. Construction began in 1898 under the supervision of architect Sir Alfred Brumwell Thomas and was completed in 1906 at a cost of £369,000. Local firms H&J Martin and WH Stephens were among the companies involved in construction. Belfast was made the capital of Northern Ireland in 1920. On August 1, 2006 the City Hall Belfast celebrated its centenary with a "Century Of Memories" exhibition and family picnic day. It covers an area of one and a half acres and has an enclosed courtyard. Featuring towers at each of the four corners, with a lantern-crowned 173 ft (53 m) copper dome in the centre, the City Hall Belfast dominates the city centre skyline. As with other Victorian buildings in the city centre, the City Hall Belfast copper-coated domes are a distinctive green. The interior has a number of notable features including The Porte-Cochère and Grand Entrance, The Grand Staircase, The Reception Room and The Great Hall. The latter was destroyed during the Belfast blitz and subsequently rebuilt. Carrara, Pavonazzo and Brescia marbles are used extensively throughout the building as are stained glass windows featuring among others the Belfast Coat of Arms, portraits of Queen Victoria and King William III and shields of the Provinces of Ireland. The gardens surrounding the City Hall Belfast are very popular with office workers taking their lunch in the summer months, when the good weather arrives! as well as tourists and teenagers gathering in their dozens to enjoy the green. Various statues stand in the grounds, including one of Queen Victoria by Sir Thomas Brock. There is also a granite column dedicated to the American Expeditionary Force, many of whom were based in Belfast prior to D-Day. Brock also designed the marble figure of Thane, the Titanic Memorial, in memorial to the victims of the sinking of the RMS Titanic. You can click here to go to detail on the Titanic ship. The ship was built in Harland and Wolff's shipyard located in the east of the city. The Titanic monument was originally located at the front gate of City Hall Belfast , at the junction of Donegall Square North and Donegall Place. There is a memorial to Sir Edward Harland, the former head of the Harland and Wolff shipyard and Mayor of Belfast from 1885 to 1886. It too was sculpted by Thomas Brock. The grounds of City Hall Belfast also house Northern Ireland's main war memorial, The Garden of Remembrance and Cenotaph, at which wreaths are laid on Remembrance Day. James Magennis VC, the only Northern Irish recipient of the Victoria Cross during World War II, is also commemorated in the grounds. The Leading Seaman won the medal while serving in the Far East in 1945. A 6-foot-high (1.8 m) memorial to Magennis, made from Portland stone and bronze, stands in front of the City Hall. It was erected in 1999. On January 3, 2006 Belfast City Councillors ratified a plan to erect a statue to the late Belfast footballer George Best in the grounds of the City Hall Belfast . Following approval from the Best family, the George Best Memorial Trust was created in December 2006 at the estimated total cost of £200,000. In October 2007 a 60 m Ferris wheel was constructed in the grounds, giving passengers panoramic views 200 ft (61 m) above the city. The wheel had 42 air-conditioned capsules, which could hold up to six adults and two children. The wheel finally closed at 6:00pm on 11 April 2010 and was removed during May 2010. In 2008, the Imjin River Memorial was relocated here when the Royal Irish Rifles barracks in Ballymena closed. The memorial commemorates Irish troops lost in the Battle of Chaegunghyon, January 1951 during the Korean War.This is the only memorial in Northern Ireland to the Korean War and is the focus for the Korean Veterans Association of Ireland. Free public tours of City Hall Belfast are available Monday to Saturday. Led by an experienced guide, they last around one hour and uncover the history of Belfast City Hall, while exploring some of its finest features. Public tours are available at the following times: Monday to Friday - 11am, 2pm and 3pm Saturday - 2pm and 3pm. They are available on a first-come, first-served basis and leave from the reception area inside Belfast City Hall. There are no tours on Sundays, bank holidays or public holidays.